This week I have the pleasure of attending the London Film Festival, and the first film I had the pleasure of seeing, was J.A. Bayona's film, A Monster Calls! It is a beautiful, emotional film that resonated with me, maybe more than any film I have seen this year! A Monster Calls follows Conor O'Malley (Lewis MacDougal), a young boy trying to deal with the terminal illness of his mother (Felicity Jones) and the attacks by local school bully Harry (James Melville). 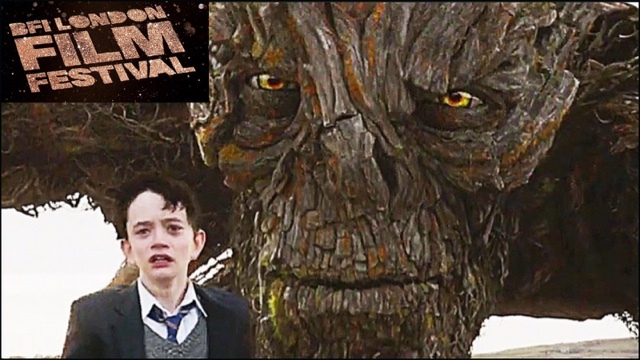 One night, Conor encounters a "monster" (Liam Neeson) in the form of a giant humanoid yew tree who has come to tell him stories and soon begins to help Conor fix his unhappy life. The performances are excellent! In particular Lewis MacDougal who delivers, maybe the best child performance this decade. He gives such an assured, yet fearful performance that really impressed me. Felicity Jones, who plays the boy's mother is also brilliant and possibly the only performance here that could get an Oscar nomination. She kills it. Her performance is so raw, so real, and she has a scene that will make even the hardest of people cry. The rest of the cast is also very good. Sigourney Weaver does very well as the boy's strict Grandmother (her English accent was surprisingly really good), Liam Neeson's voice performance as The Tree is heart warming, yet scary and sometimes quite funny, and Toby Kebell is solid as the boy's crappy father. The visual effects are brilliant. The budget, I imagine, is quite small compared to the big VFX productions we see every year, but the VFX is in this film, for me, challenge The Jungle Book for the best all year. The musical score is subtly great, and that is how I like my scores. The one's that you barely notice, yet stick in your brain for a few days. The screenplay, by writer Patrick Ness, who wrote the novel of the same name for which the film is based on, is very good, and the direction by J.A. Bayona is wonderful. What I love most about Bayona as a director, is the way he directs his actors. His previous film, The Impossible, had great performances from Naomi Watts, Tom Holland and Ewan McGregor, and here he has directed, like I stated above, some of the best performances I have seen all year. I wouldn't consider this next little piece a spoiler, but for those who would here is an alert -- SPOILER SPOILER SPOILER -- There is also some wonderful animated scenes that I was very fond of. END SPOILER. The only problems I had with the film is that, it took me around 10 minutes to truly get into the film, and some part of me knows that the film is a little emotionally manipulative, but I was so engrossed in this heart-breaking film, both of my ''Negatives'' become very small nit-picks. A Monster Calls is one of my favourite films of the year, and I highly recommend it!